Governor Abubakar Sani Bello of Niger state has insisted that his predecessor, Governor Muazu Babangida Aliyu was engaged in wasteful spending, Governor Bello who first accused Babangida Aliyu in a media chat of may 29, democracy day to which Governor Babangida Aliyu reponded that Governor Bello should present facts or shut up. This spat has necessitated another response from Governor Bello, in this release signed by Jide Osuntirin, media coordinator to Governor Abubakar Sani Bello, he said Governor Babangida Aliyu’s projects were on paper. 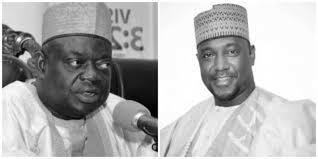 Efforts were made by Niger State Governor, Alhaji Abubakar Sani Bello over the years not to join issues with Dr. Mu’azu Babangida Aliyu, the immediate past governor of the state on his 8 years administration. On assumption of office in 2015 we chose to draw the line in order to focus on his restoration agenda despite the massive deterioration and decayed system inherited. It is uncharitable and uncivilized for Dr. Mu’azu Babangida Aliyu to have brazenly threw caution to the winds by arrogantly accusing his successor of feeding the people of the state with outright lies and cheap sentiments, when in the true sense, these are the tools deployed in governing the state during his 8 years of administration. As a matter of fact, Governor Sani Bello never accused his predecessor of not investing but that majority of the projects are not only over inflated, some were misplaced without direct impact on the immediate communities while some were outright white elephant projects. Today, most of the so called investments that the past administration prides itself of suffered on arrival. It is on record that some of these projects never took off before Dr. Babangida left office on the 28th May, 2015. Especially the well articulated projects on paper by the portfolio carrying investors that invaded the state during the period under review. Sadly millions of Naira of public funds were sunk on the never to take off projects. One recalled with regrets the fun fare and the huge budget expended on climbing of Zuma Rock under the disguise of flagging off a tourism project. The cable car project linking the rock to the popular Gurara Waterfalls; the half a billion naira burnt on the drawing and feasibility study of the moribund 5-Star Hotel in Minna; the massive Minna City Center project; the conversion of IBB Specialised Hospital to a world class facility and the over bloated New Minna Township Stadium in Maikunkule to mention but a few. One then wonders what proof Dr. Babangida requires. One is hasten to ask, what is in an investment that has failed to yield dividend years after? How many of such investment took off before the expiration of his term? The irony of it is that the huge expendure on all these non-yeilding projects would have been used to fund infrastructure when the value of naira was appreciably high. Despite several promises made by the Talba administration to defray all the bonds secured, it is on record that we have to rescheduled repayment till 2021. One would have expected Dr. Babangida to be the one to keep mute rather than challenging his successor. Governor Sani Bello wish to reaffirm that his predecessors, especially, ex-Governor Babangida Aliyu was to blame for the sorry state of infrastructure in the state. The immediate past PDP administration indulged in wasteful spending. Instead of the ex-governor to effect the completion of many people oriented projects of his predecessor, Engr. A. A Kure, majority of which were 70 percent completed were abandoned untill this administration took them up. Governor Sani Bello will not be distracted by any mischief or cheap blackmail by the immediate past administration. We have a mandate and that is to restore the glory of our dear state.